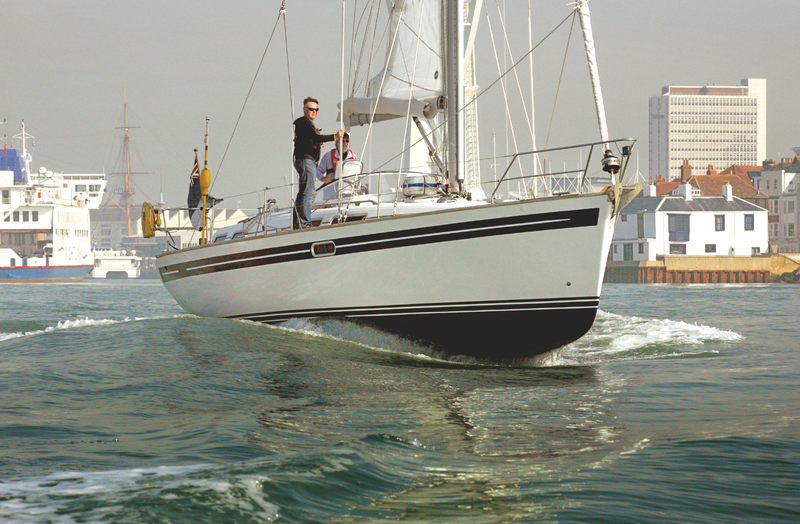 The Moody 42 was designed for long-distance cruising, so she is solidly constructed and simply but stoutly rigged. Her high displacement and sail area/displacement ratio put her firmly in the cruiser bracket. Her displacement to waterline comparison is more favourable performance-wise than the earlier Moody 40, but still means she is stiff and well able to stand up to her sail. 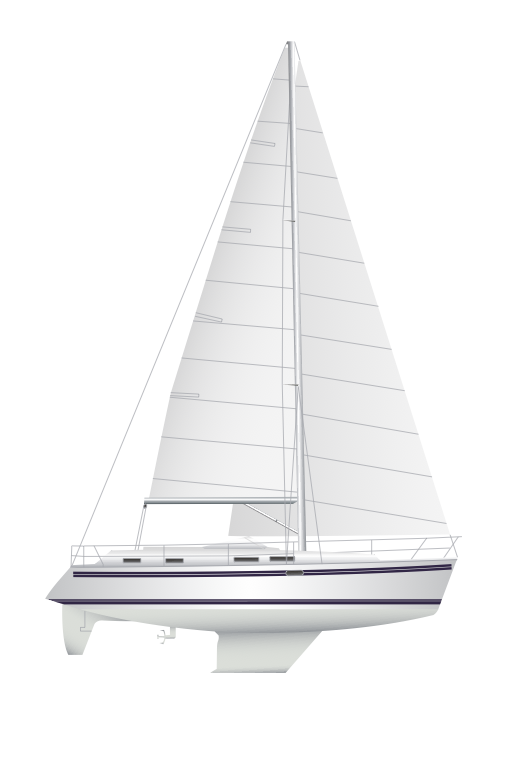 Her ballast ratio is not as high as some, but putting the greater part of the cast- iron ballast in a bulb at the keel foot means it is more effective. She is easy to sail singlehanded as all the sail controls are within easy reach of the helmsman. The cockpit, however, is a long way above sea level and the genoa is large and low-cut, so visibility forward from the cockpit is severely restricted. The semi-balanced rudder keeps the helm light but positive and the half skeg increases the integrity and strength of the rudder mounting. She is an easy and satisfying yacht to sail, so long as you’re not expecting her to be a flyer in light airs. Where she makes up for it is in her ability to keep powering on in heavy seas and to stand up to her sail plan, even when you let her become slightly over-canvassed. She also has a gentle motion at sea, making living aboard her on long passages safe, secure and comfortable. Her foredeck is flat and uncluttered, and she has twin, self-stowing anchor bow rollers, which are essential if you want to weather out a gale on the hook. She also has a powerful electric windlass and a deep anchor chain locker with enough space for at least 60m (196ft) of heavy chain and a further 20m (65ft) of warp. The headsail furling drum is a foot or so above the deck, well clear of the anchor, and her slightly overhanging bow helps protect her stem when retrieving the ground tackle. The deck area is ample and uncluttered – especially the afterdeck, where there’s room to sunbathe, shower or inflate a dinghy. Gates in the guardrails and two deep steps give good access to the water and the steps are wide enough to stand and shower on safely. She also has a deep, fold-down boarding ladder. You won’t get more than four in the cockpit comfortably, or six if two sit behind the wheel, but below decks her saloon is roomy enough to cater for six dining or eight for a relaxing drink. The Moody 42 is a big boat – both in interior volume and displacement terms. She’s equally suited to coastal family cruising or more ambitious blue water work. She’s very comfortable to live on, both under way and at anchor, and there’s enough room for all the long-term cruising essentials such as a generator, inverter, watermaker, hot water tank, extra batteries, dive gear, kedges, dinghy and so on, without having to lash stuff to the rails. For those who like a good-size, dedicated navigation station with bags of room for displays and instruments, the Moody 42 certainly cuts the mustard. If you like to feel safe and secure in all weathers and are not interested in chasing others around the cans on a Sunday morning, then this boat could be the one for you. If the price tag is a little too scary, then the earlier Moody 40, or even the Moody 38 (not the 38S) might be the answer. Both are equally well built and luxurious – just a little smaller.